Carl Johnson escaping with the Jetpack in the misssion Black Project. A Jetpack hovering at Verdant Meadows. The Jetpack HUD icon, though it does not appear in the game it still exists in the games image files. The Jetpack is a mode of transport in Grand Theft Auto: San Andreas that allows the player to hover, ascend, descend and generally fly around in the air. It allows for directional control with two omnidirectional nozzle-like jets providing thrust. And like any other vehicle it has unlimited fuel. The Jetpack is unique - it acts like a weapon pickup when not in use, is activated instantly when the player walks into it, and is dropped when the vehicle exit button is pressed. It has a much lower altitude limit than other aircraft, so is not ideal for scaling taller buildings. The jetpack is indestructible as it is does not really count as a vehicle, and it also makes the player invulnerable to falling, crashing into walls or moving vehicles, landing on top of a moving helicopter and other dangers. It can also be fully submerged without damage by diving into water at high speeds (though it will automatically return CJ to the water surface). The Jetpack is a $60 million prototype created in the US military's underground lab in Area 69. 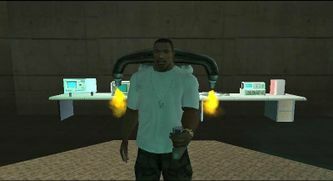 Carl Johnson is dumped in-front of Area 69 and is told to steal the 'Black Project' by The Truth in the mission Black Project. Due to the secrecy of the project, The Truth is the only civilian other than Carl Johnson to know of its existence. After this mission, the Jetpack will re-spawn at Verdant Meadows. Carl later uses it to attack a military train in the mission Green Goo. The Jetpack permanently spawns in Verdant Meadows after completing the mission Black Project. Only the 'one-handed' weapons can be used while the Jetpack is in use. The Pistol, TEC 9, Sawn-off Shotgun, and the Micro SMG can only be used. Oddly all of these weapons can be dual wielded while using the Jetpack, but Carl always uses one hand to control the Jetpack. At the lowermost section of Area 69 after completing Black Project, although exploits are needed to access it. If the player is shot dead while flying the Jetpack, they will remain alive while airborne, however the jetpack will slowly gravitate towards the ground, then when it hits the surface, CJ will automatically dismount the Jetpack and then be wasted. If player spawns the jetpack while riding a bicycle (BMX,Mountain Bike or Bike), the player rides the bicycle without pedaling. If the player is on a Mountain Bike they can reach highway speed easily. The game AI considers the player to be an aircraft while flying the jetpack, thus SAM sites will fire at the player if they fly over Area 69 and Easter Basin Naval Station. This page was last modified on 25 March 2012, at 22:47.